Inspect the synchro rings for scoring, cracks, and damage (A). 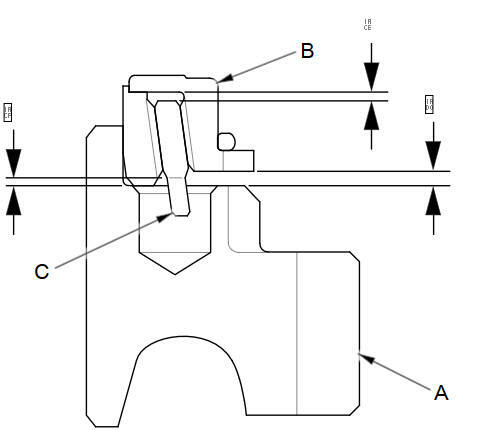 Inspect the inside of each synchro ring (B) for wear. 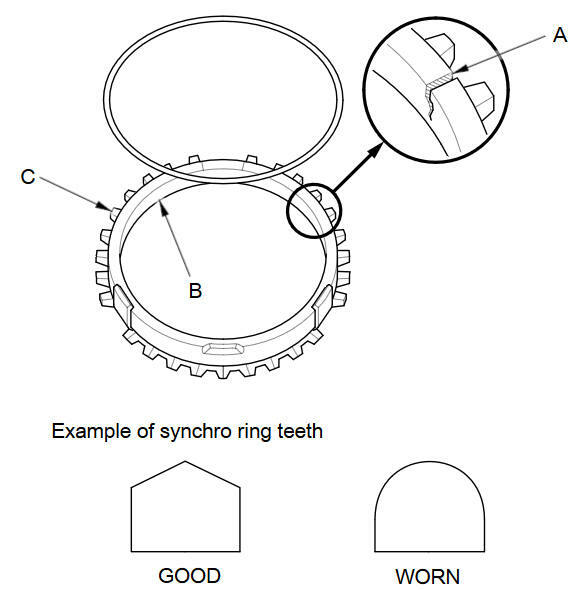 Inspect the teeth (C) on each synchro ring for wear (rounded off). 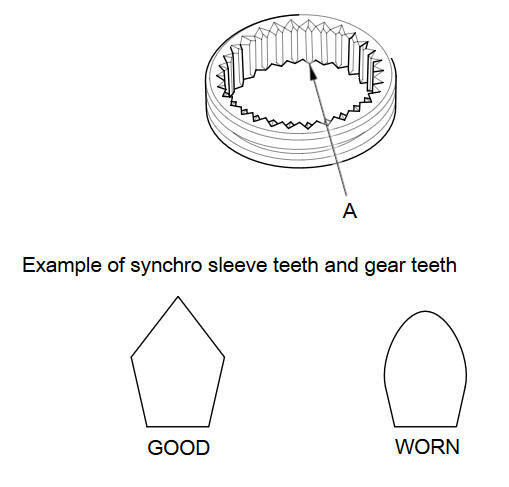 Inspect the teeth (A) on each synchro sleeve and the matching teeth on each gear for wear (rounded off). Inspect the synchro teeth on gear for scoring, cracks, and damage (A). 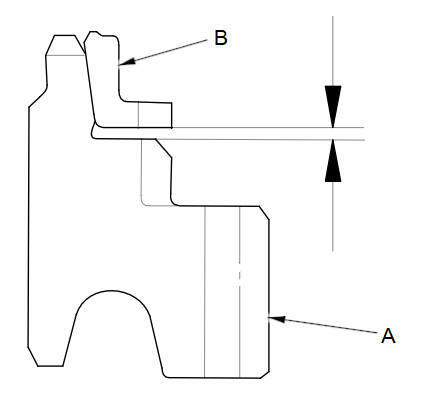 Inspect the thrust surface (B) on each gear hub for wear. 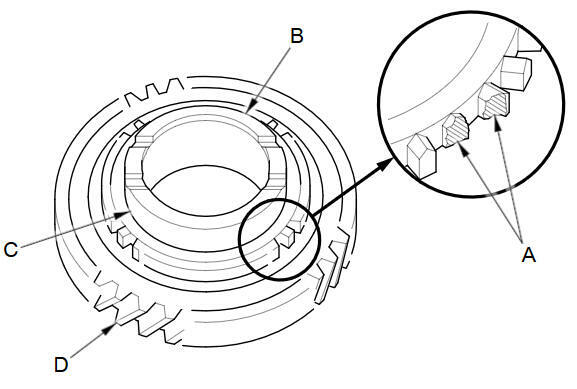 Inspect the cone surface (C) on each gear hub for wear and roughness. Inspect the teeth on all gears (D) for uneven wear, scoring, and cracks. Coat the cone surface of each gear with MTF, and place its synchro ring on it. Rotate the synchro ring, making sure that it does not slip. 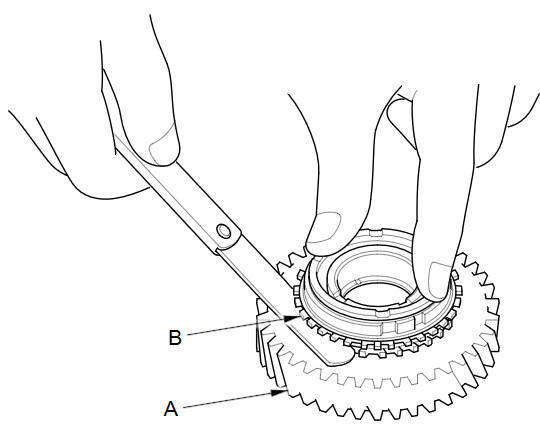 Measure the clearance between each gear (A) and its synchro ring (B) all around the gear. Hold the synchro ring against the gear evenly while measuring the clearance. If the clearance is less than the service limit, replace the synchro ring and gear.